A dark slide is a sliding cover, commonly a very thin sheet of metal, that closes part of a camera to light. The term has come to mean a holder for a sheet of film (or previously a glass plate), in the form of a shallow box, closed by a dark slide (these holders are commonly double dark slides, containing two sheets of film, and with a dark slide cover on each face). Most large-format cameras accept film in this way. The dark slides are loaded in a darkroom or dark-bag, and the camera can then be loaded in the field in daylight. Once in the camera, the dark-slide cover can be withdrawn without exposing the film. Removable roll-film holders used with some large- and medium-format cameras (for example the Graflex Speed Graphic, the Koni-Omega and the Hasselblad 500 C) also have dark slides. 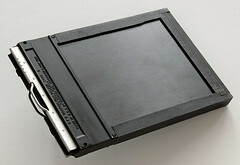 Dark slides made to take glass plates can be used with sheet film by loading film into a film sheath. This page was last edited on 6 November 2015, at 00:31.